Difference between revisions of "Alexei II (Ridiger) of Moscow"
His Holiness Patriarch '''Alexei II (Ridiger) of Moscow''' (born [[February 23]], 1929) is the current Patriarch of Moscow and the head of the [[Church of Russia|Russian Orthodox Church]]. He was born as '''Alexey Mikhailovich Ridiger''' in Tallinn, Estonia, to the family of a [[priest]]. He graduated from Leningrad clerical seminary in 1949; was ordained [[deacon]] in 1950; graduated from Leningrad clerical academy in 1953. On [[August 14]], 1961, he was chosen to be the [[Bishop]] of Tallinn and Estonia. On [[June 23]], 1964, he was promoted to [[archbishop]]; and, on [[February 25]], 1968, at the age of 39 - to [[metropolitan]]. After the death of Patriarch Pimen in 1990 Alexei was chosen to become the new head of Russian Orthodox Church. Despite his age, Patriarch Alexei II is quite healthy and leads an active political life. He is frequently seen on Russian TV, meeting with politicians and expressing opinions that are usually in line with political opinions of the President of Russia. On July 17, 2007, the Wall Street Journal published a front page article in which it identified Patriarch Alexei as a former KGB agent, with the code name "Drozdov". [http://online.wsj.com/article_email/SB118469533202469128-lMyQjAxMDE3ODE0NzYxOTc1Wj.html] The article also presented documents from the Estonian archives, indicating that Agent "Drozdov" actively informed upon priests in the Soviet Union. His Holiness Patriarch Alexei II (Ridiger) of Moscow (born February 23, 1929) is the current Patriarch of Moscow and the head of the Russian Orthodox Church. He was born as Alexey Mikhailovich Ridiger in Tallinn, Estonia, to the family of a priest. He graduated from Leningrad clerical seminary in 1949; was ordained deacon in 1950; graduated from Leningrad clerical academy in 1953. On August 14, 1961, he was chosen to be the Bishop of Tallinn and Estonia. On June 23, 1964, he was promoted to archbishop; and, on February 25, 1968, at the age of 39 - to metropolitan. After the death of Patriarch Pimen in 1990 Alexei was chosen to become the new head of Russian Orthodox Church. Since the collapse of the Soviet Union there have been accusations that Patriarch Alexei had ties to the KGB agent, which resulted from documents which allegedly came from the KGB's archives in Estonia, and which refer to Patriarch Alexei with the code name "Drozdov". It should be noted that it was very unusual for any person to be referenced in KGB documents prior to 1980 without a similar code name, regardless of their affiliation with the KGB. 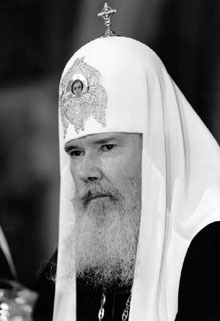 Patriarch Alexei has always denied that he was a KGB agent, and the authenticity of the documents in question have been disputed on the basis on the basis that they use anachronistic fonts which did not exist at the time the document ostensibly originated from, and that the Estonian government fabricated the documents in order to discredit the Russian Orthodox Church. Patriarch Alexei has, however, acknowledged that compromises were made with the Soviet government by bishops of the Moscow Patriarchate, and publicly repented of these compromises. His name (secular Алексей, clerical Алексий) is transliterated from the Russian alphabet into English in various forms, including Alexius, Alexei, and Alexy. This page has been accessed 98,047 times.